I had the privilege of interviewing Jamee, she sat down with me on a Friday afternoon over tea to chat about her career as a dance artist and artistic director of Valence Movement (dance theatre). My goal was to get some insight from Jamee as an “established emerging dance artist” in the community to share with fellow students and emerging dancers to hopefully inspire and believe in the possibilities for creating dance in Canada. Q. How do you wish to be identified as an artist? What do you want to be remembered as? That’s a really relevant question for me right now, in the next few months I am going to try and brand myself as a solo dance artist. It is time for me to get back to where I started, back to when I started making work for myself, by myself. There are certain dance artists I look up to; Peggy Baker is a solo dance artist and Louise Lecavalier. These are older women in Canada that I aspire to be like. I just want to be that old person, [hahaha] skip all the rest. Q. When did you realize dancing was going to be your career choice and at what magnitude? I think I always knew I wanted to dance, since I was a pre-teen. But it was more dance as a performance, I knew dance from a competitive performance realm, not from an artistic realm. I don’t think I realized I was actually a creative person until I was at university in 2007. I hadn’t realized the way my brain worked was in a creative way, and the artistry in that came later. Valence Movement (dance theatre). 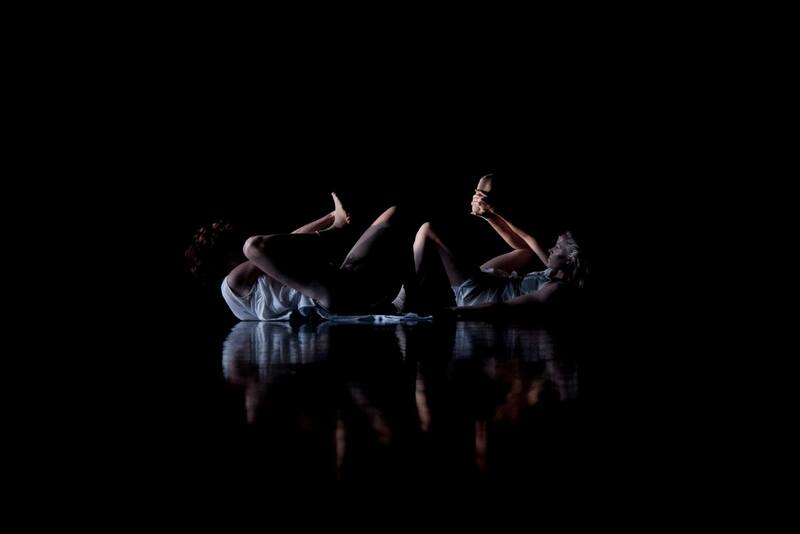 Dancers Jamee Valin, Alison Fudger. Swim Float. 2013. Dance: Made in Canada. Betty Oliphant Theatre, Toronto. Photo by Chloe Norman. Q. You graduated from the Performance Studies Program at George Brown College in 2010. How do you feel about post-secondary programs in universities and other dance training programs? Does it help/aid/effect your dancing career? It’s good for meeting people, networking and continuing training. It’s good exposure if you are from a small town, that doesn’t have the recourses a larger city would have. Did it [school] make me an artist? No, but it made me a better dancer, and made me aware of people I could turn to, to become a better artist. I have a network of people, teachers and their colleagues. It’s nice to have an identity and background to where you come from. When you train at a place that is recognized other artist have an idea of what to accept from you. They understand your training and what your interests are even before they start working with you. Your classmates have like minded interests and are people you can work with. Depending what program you pick they [the program] create similar dancers that make really good collectives. Then its fun to break that up, but at least you have a little bit of a dance family. Q. What was an accomplishment you are really proud of or did not expect to accomplish? At the age of 25 you look quite impressive on paper, what advice can you give emerging dance artist on getting their career’s started? Q. Have you had any major set backs? Mistakes you have learned from? I’ve made stuff I don’t like, [haha] lots of that. I’ve made a lot of stuff I’ve taken off my website or put private on YouTube. I think you just get better at things and you don’t use your favorite song to make dances anymore, you get past all that. I’ve made some films that now I think, why did we do that? There was one project that was hard to make, hard to perform, hard to address, and I don’t even know if I ever put on my resume. It was my first attempt at making a third self-produced show. It turned into a 10 min piece with dancers I had worked with in the past, and have since worked with. The piece was called Baring the Exterior we did it here in Vancouver. It was my first attempt of being more collaborative as a choreographer as opposed to setting work on dancers. I don’t think we had enough time to establish that relationship before our performance had to go up. When our performance went up I thought we were going to be in a theatre, and then we were in this really tiny space, the audience was as close as you are to me now. Our costumes and set were designed for theatre lighting and I built the piece in such a larger space, which affected it a lot. You really have to be sure of what you are getting into before you do it. I think that piece would have gone a lot better if we had the space I was expecting. Don’t make physical pieces when you only have 10 feet by 10 feet with 4 dancers and a pool [hahaha] and 5 pieces of fabric. Yah, it was too much. Valence Movement (dance theatre). Dancers Allyn Walton, Nick Robinson. Locked On SHUFFLE. 2010. Winchester Street Theatre, Toronto. Courtesy of the artist. Q. You founded Valence Movement (Dance Theatre) in 2010. What are the challenges it took to start a collective and keep it going? Starting was the easy part, I had my small class be in it [the company], and everyone seemed to like it, I think I was just lucky. Keeping it going was more of a challenge, especially when working with friends; it can be a little stagnant. You can get to comfortable with each other, and not challenge each other to make harder work. As a choreographer or Artist Director you need to set that relationship. Working comfortably is good, but how do you make sure your work is still progressing, that’s the largest challenge. I want to work with the same people I have been for so long, because we understand each other. Working with new people, I spend a long time trying to get them to understand my performance quality and things I expected from dancers. Kill Count, a piece I did with Project CPR, was a completely different cast than I had ever worked with. I loved it, it’s great to have new blood in the room, but hard to describe qualities that some of the dancers I have worked with for 6 years understand. It wasn’t that comfortable easy relationship I have experienced with a continuing cast. I understand why established artists making constant work like Crystal Pite will use the same dancers over and over because you don’t need to re-introduce how to perform the work. Q. You moved to Vancouver after training in Toronto, how has that helped your career? Did you have to make any big sacrifices by leaving the city in which you started your company? Yah. I would say it was harder more than it was helpful, especially because Vancouver is so small. A lot of established artist spend half their time creating work and the other half on tour, so unless they are teaching while they are here and you can take a class that doesn’t conflict with your rehearsal schedule, you have no way of meeting them. This is a small community, [“established emerging artist”] if you are from a city you’ll have had more opportunities to network before you begin your performance career. It took a long time to get to know that part [the established artists] the emerging artists was more quick. I either knew dancers at other training programs, or I would apply to be in shows, or audition together, it seemed to be easier to get to know people in your own stage of career, which is good. It’s nice to have people who are along the same lines as me. Carolyn Schmidt and I have named it “established emerging artists” that’s the level of career we are at. We aren’t fresh out of school but we are not being funded or being presented by larger hubs, but we dance a ton. Q. Recently you started working on T.B.A Choreographic Showcase along with Carolyn Schmidt. What inspired you to produce a new showcase for contemporary dance artists? Perfect timing for this question! I write blogs and write Facebook messages that are often artistic in a way to communicate with my community. Carolyn responded to one of my messages saying she felt like she was in the same boat and we should do something about it. We should make an event that allows people in our “established emerging artist” career stage to have more opportunities to perform. She knew of a space that would co-produce the event and wouldn’t cost us an arm and a leg. She knew I had experience in producing and felt the need for this showcase in the community. We both decided there is no point in waiting. When you apply to a million things and you don’t get invited to do anything at the larger scale yet, you need more practice time, and more time to continue making work, but it comes to a point where you want to do it for real. It’s like what I did in Toronto with my self produced work. Co-producing a smaller choreographic showcase and being part of a community is more interesting to me at this point. I’d love to make another 60 min long piece but at this point I’d rather be within the community. Q. Obviously you need more skills that just being creative to create a collective and be able to produce your own work, what would you say is the best parallel skill for a freelance dancer to have, along with creativity and dance ability? The most useful skill I think is the ability to understand what you want and to be able to communicate it to others and in writing. As dancers we aren’t very practiced at voicing what’s happening during the artistic process. To be able to talk about dance and eloquently write about what you are thinking and going through. You have to be able to communicate with either your choreographer, sending messages to people, even being able to write a good email. Your communication is really important, for teaching, choreographing, producing, all things you do dance related. If you can’t communicate what you need and what you want, you are not going to get it. I have danced in a lot of things I shouldn’t have done but I just did it because it was dance, you have to know what you want, or know that you don’t know what you want and you are still exploring and then one day you will know. Don’t be the dancer you were in college 5 years down the road, just get better, just don’t stop. Q. If you could do one thing for the rest of your life, money/issues everything aside what would you be doing? I would be 100% Valence Movement (dance theatre) all of the time. I would have collaborators to do the parts I’m not as good at like sound design, costume design, set design, I do all of those things but they are not skills I posses well. I would have a company that ran all the time. It would be a 50/50 split between my solo dance artist work and making work on 5-10 other dancers in the company. I would be Pina Bausch and Peggy Baker [haha] both of them, Yah.